On a historic day in the Amazon Room, the last week before the start of the $10,000 Championship Event on July 28th was in full swing and definitely brought the crowds to watch their favorites play. The $2000 No Limit Hold 'Em event was in its second day and the $1500 Seven Card Razz tournament kicked off its play (with both slated for final tables on Sunday). In addition to this, the $5000 Pot Limit Hold 'Em tournament got off to its start along with another big dollar final table at Event #30, the $5000 Short Handed (six player) No-Limit Hold 'Em tournament. Not only was our youngest ever bracelet winner Madsen (who took the gold this year in one of the earlier $2000 NL events) at this table, chip leader Gaskell was all of one DAY older than Madsen. Along with Foltyon and Lindgren, it definitely gave the final table a very youthful appeal. "I feel like I'm playing against my sons," "Captain" Tom Franklin pointed out (to the delight of the audience) as the cards and chips flew around the table. Early action was a little on the slow side, however. With so many chips in play, there was very little that happened. Franklin did choose the early fifty hands or so of the tournament to double his stack up twice against the chip leader Gaskell, however, removing the British player from the top of the leader board and bringing everyone a little closer together as the hand count (and the blinds) went up. Late in the second level of the day, with the blinds at 8K/16K with a 2K ante, we did see our first elimination of the day. Gaskell was able to get back some of the chips he had lost to Franklin on Hand 59 (two minutes before the break) he went to war with his countryman Foltyon. Under the gun Foltyon moved his stack into the center of the table and was called by Gaskell on the button. He had caught Paul in a total blind steal; Foltyon had moved in with a 8s-6h and Jonathan had him dominated with an A-J. A Jack came on the flop and once the board paired with a Queen on the turn, Foltyon was drawing dead and eliminated from the tournament in sixth place. One of the players making some noise in the early going was Erick Lindgren. The Full Tilt Poker team member, even with the veteran Franklin on his right, was able to build his stack up nicely through aggressive play. On a couple of occasions at the beginning of the tournament, he went on a several hand long streak where he took the pots without any challenges from his opponents. This allowed him to assume the chip lead and Lindgren continued to captain the table as the blinds went up again. The action heated up once the blinds went up to 10K/20K (with a 3K ante). Lindgren continued his assault on the table and, on Hand 83, he raised the pot to 50K under the gun. Gaskell decided to step up to the challenge and moved all in over the top of the former WPT Player of the Year and Lindgren accepted the challenge. Gaskell had the dominating edge with pocket Kings against Lindgren's A-K, leaving Erick looking for three outs that would allow him to eliminate Jonathan. The flop and the turn worked perfectly for Gaskell (4-7-J-8), but the Ace on the river couldn't be avoided by the Englishman as Lindgren applied a bad beat to take the hand and usher Gaskell from the event in fifth place. About twenty hands later, Lindgren once again continued to abuse his fellow players as he eliminated the next player. Both he and Tony Woods got all their chips to the center of the table with Lindgren this time holding the other end of the coin flip. His pocket Jacks held the preflop lead against Woods' Big Slick but, when the board came completely blank, Woods was dispatched from the Amazon Room in the fourth place slot. On Hand 110, we worked our way down to two players with the departure of "Captain" Tom. The elder statesman of the table had battled along with the two remaining "kids" at the table (with the 30 year old Lindgren and the 21 year old Madsen) but couldn't gain on them. On a flop of 10-3-6, Franklin and Madsen ended up getting the chips together and the good "Captain" turned up top pair with a Q-10. Madsen outpipped him, however, as his K-10 held the lead as the two saw a turn of an Ace and the river seven. Without a Queen to deliver his salvation, "Captain" Tom Franklin saw his second journey to the final table at this year's World Series end in third place. 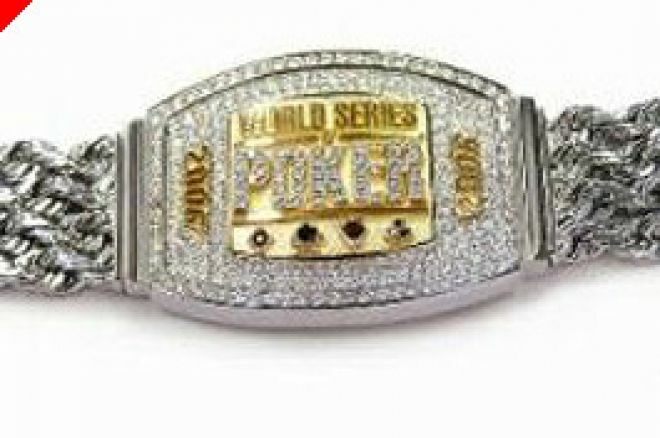 The two began an epic battle as Lindgren attempted to take his first World Series bracelet and shed the title of "best player to not have won at the World Series" tag. Over the next fifty four hands, Lindgren chipped Madsen's stack down, only to see the youngest WSOP bracelet holder wriggle his way back into the match. On Hand 159, the two hooked up into a hand that would determine the outcome of the event. Madsen raised the pot to 55K and had Lindgren returned fire by jacking the stakes up to 170K. At this time, Jeff decided to make his stand and called all in. After a moment's deliberation, Erick called his bet and flipped Ac-Kc up once again. Madsen's pocket eights held the lead and it was only lengthened when the flop came down 9-A-8c. A two of clubs on the turn opened the doors to a possible draw out by Lindgren to the flush, but it went unfulfilled with an innocent four on the river and Madsen doubled up with the victory and took the lead. Madsen now seized the momentum advantage as he now held the same lead that Lindgren had brought in to their heads up meeting. He seemed to catch all the right cards at all the right times and chipped down Lindgren gradually over the next twelve hands. Cheering their fellow Full Tilt member from the sidelines and playing Chinese Poker to pass the time (and I will still say I don't get the game! ), Phil Gordon, Gavin Smith and Roland DeWolfe encouraged Lindgren to spark a comeback that wouldn't unfortunately happen. On Hand 171, Lindgren raised from the button to 65K and was called by Madsen. The Q-K-2d flop brought a bet from Jeff that would put Lindgren all in if he called and, after going into the tank for some time, he decided it was time to make his move and called. Lindgren had missed the board but had a draw with an A-J of diamonds; Madsen, meanwhile, had hit the board once again with his Q-9. The five of diamonds provided some more excitement for the gallery surrounding the final table but the blank three on the river ended the tournament with a new double bracelet winner at this year's World Series with the crowning of newcomer Jeff Madsen as champion. With his victory, Madsen not only becomes the second two time bracelet winner at this year's World Series (joining William Chen), he also becomes the youngest two time bracelet winner in the history of the World Series at 21 years old. With his three final tables, he has also amassed over $1.4 million dollars and should also take over the lead on the 2006 WSOP Player of the Year race. By going from "worst to first" in this event, it could also signify the dawning of a potential new force on the tournament poker scene with the arrival of Jeff Madsen during this year's World Series.